It reminded me of how I feel when I’m putting a novel together. To start with, everything is fragments – locations I want to use, characters I know will be important, revelations I feel will be pivotal. Scenes that come in a flash of inspiration. None of them seem to particularly connect. It’s like seeing each of them down a telephoto lens and not knowing what’s around the edges, how it connects with everyone else. Seeing the first reviews of Hereafter have reminded me of the fragments I was involved in. And at the time, my WIP was at a very sketchy stage, but now the view has widened. The threads have pulled together. Themes have emerged and resound throughout the story. And it’s now making sense. It’s funny to look back and think what scant material I started with. This entry was posted on October 31, 2010, 9:01 pm and is filed under Inspirations Scrapbook, Plots, Writer basics 101. You can follow any responses to this entry through RSS 2.0. You can leave a response, or trackback from your own site. I know the feeling. I was the canine consultant for the film “Best In Show” and whenever I see it on screen I remember wondering how all the isolated scenes would ever fit together to make a coherent movie plot. But they did. And yes, the same thing happens with individual scenes in my novels. Funny, isn’t it? Happy NaNo to you too! I’m not sure whether this is relevant, but when I first moved to London 16 years ago I travelled mostly by tube and each location existed in its own unconnected bubble. Now that I have a much better mental map of the city, I sometimes come across places from that era and have the satisfaction of slotting them into the jigsaw puzzle. Paul, what a lovely example. The Tube is like having a teleport, isn’t it? And that is an interesting mental game to play, remembering a place as you first knew it, and now fitting it into a bigger picture. Absolutely. That’s how all my novels start–with little flashes of scenes here and there, then I pull out the most interesting character and build a story around the character and the scenes I see in my mind. Then one day I have a complete story. Teresa, that’s slightly different from what I usually do – I usually start with a character doing an odd thing, and then I ask questions all around it. But I like the idea of allowing a few people to assemble and then seeing who’s most interesting. Watch out for me in the crowds at the London Book Fair scenes and in the audience of Derek Jacobi’s reading. 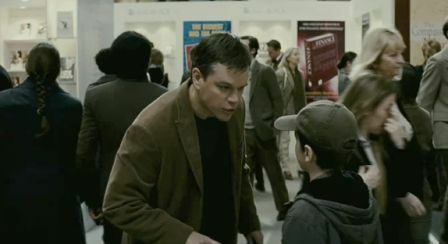 And I was told to walk across the foreground of the shot in one scene where Matt Damon is being pursued by the boy – the scene in the photo. Although I’m not in that pic as I’m actually standing behind the cameraman by then! Sounds like it was a great adventure, Roz! I am absolutely of the flash school of novel-building. I always see my stories in pieces at first–characters, a setting, a conflict, etc–and then find the links to bind them together. I like Paul’s analogy very much. It certainly was special adventure. I don’t get many extras jobs because of my hair being a bit noticable, but this one really was the jackpot. Yes, I really like Paul’s analogy too. How fun! I start with an outline but even with an outline I have no idea how the story’s mood or tone will feel or what will surprise. So, yeah, that’s a good analogy. And yes, tell us about the film. Hi Laura! That’s interesting, isn’t it, how the mood and tone can change so much as you feel your way into the story and explore its nooks and crannies. More about the film in my reply to Daisy below! Roz, interesting! Learned about this movie just yesterday on CBS Sunday Morning. You can probably find the transcript on their site. Eastwood, Damon etc. And now we add ROZ MORRIS! So what does an “extra” do? When I introduce your guest post next week, shall I mention this? A photo you’d like to include from the movie, perhaps? Otherwise, fragments and connections absolutely. I love to take 3 unrelated ideas and build a poem around them, finding the thread that unites or illuminates within. Creativity seems to revolve around fragments, really. 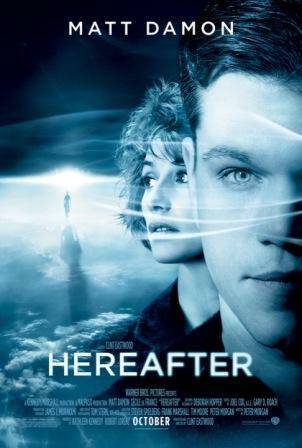 Great post, as always, and congratulations around the movie, Hereafter. P.S. Do you know blogger Kate Mayfield, by any chance? Believe she lives in London and she grew up in a funeral home, is writing a memoir about it. Check this out @ http://everycityisasmalltown.blogspot.com/ (Halloween at the Funeral Home) She’s also on twitter @katemayfield. Might be a fun “connection” for both of you! Hi Daisy! Creativity always starts with fragments, I think. That’s inspiration, isn’t it? Nice example of taking unrelated ideas and drawing them together. As for my post – mention the film if you like, but just for fun. Extras don’t do very much, I’m afraid. We make the film look populated and wander around in the background. It’s not acting, at all, and doesn’t take any artistic skill except patience – it’s like being a piece of furniture! In one shot I had to walk slowly around the set, pretending to talk to another extra. In another I was asked to cross in front of the camera just as Matt Damon was coming around the corner and into the shot – so I might be in the foreground of that one. It’s the first time I’ve done an extras job, as I signed up with a casting agency early this year – mainly for new adventures. (I did that because last year I auditioned for part in an advert as a dancer. I did it as a joke but I was chosen. The full story is on one of my posts – click on the ‘interviews’ tag). Hereafter was quite a cushy job, apparently (apart from getting up extremely early). Most of the other extras on the set were veterans of all sorts of blockbusters – Robin Hood, Harry Potter, Clash of the Titans. Many of them had spent much of their working days pretending to be dead in a wet ditch, and dressed in codpieces. And a lot of that time isn’t filming, it’s waiting for the shots to be set up. They were saying how grateful they were to be a)indoors b)allowed to have pockets and c)warm! Plus the film people had asked actual publishers to set up the stands they would be using at the London Book Fair, which meant that during downtime we had tons of books to read. I don’t have any photos, I’m afraid – I’d have been thrown off the set for taking in a camera. Several people did, even the seasoned extras were gobsmacked to find themselves on a set with Clint Eastwood. Some of them were caught taking photos when the rushes were viewed and the shots were ruined. But the photo at the top of this post is one of the scenes I’m in. And when it comes out I will be watching with a magnifying glass! Not just to see myself on a gigantic screen, but because it was a very special creative experience. At the time I wrote a diary piece for friends. Unfortunately my computer had email meltdown and deleted it from my Sent folder, but I’m trying to get another copy because it has some great anecdotes. Including a short but actual conversation with Mr Eastwood. Thanks for the tip about Kate. Her story sounds very interesting. I’ve just added her blog to my Google list and I’ll go and find her on Twitter. Have a great day! This sounds fabulous – right up my street; can’t wait to see it. Thanks, Kathryn! I think it will be a special story. Wow. What a neat experience! As a Matt Damon fan, I’m experiencing twinges of envy. 😉 Looking forward to seeing Hereafter, and I’ll definitely keep my eyes open for you! Thanks, Katie. Most of the extras were having palpitations, in fact. If Damon didn’t get them, Eastwood did. Sounds like a fantastic experience! I don’t think I’ve ever seen a celebrity in the flesh, must be kind of like a wild life sighting! I agree that the beginning of a new wip is bits and pieces that grow together and somehow make a whole. Great post once again. Spotting immensely famous people is a bit peculiar. A sort of crossing of worlds. Glad you liked the post! Hey Les, I kept rather detailed notes – and who knows what I shall do with them? Oh!! Dickens. I had no idea. I’m reading Nail Your Novel now, enjoying it. Thank you, Elisabeth! Just had a look at your blog and added it to my Google reader. And in a few moments it should appear on my blogroll too.